Thornton Academy senior Jason Montano enters the New England Championship looking to defend his title from a season ago. Montano won the indoor title with a heave of 55-10 last winter, he added to his cache with a 59-2 1/2 throw during the outdoor season to win again. Montano has a best of 63-0 on the season which he did in winning the SMAA Southwestern title, breaking the longstanding league record of Ed Bogdanovich which has stood for forty years. He repeated as Class A champion breaking the state meet record with his toss 62-0 1/4. He currently ranks 4th in the country in the event. It won't be easy to repeat as a the top shot putter in the country Aiden Felty of Innovation Academy Charter School has been clicking on all cylinders this winter stands in his way. 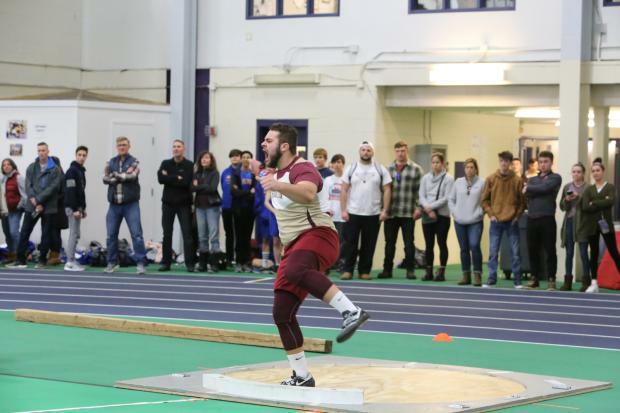 Felty has thrown a best of 67-0 this winter, and is coming off a win at the MA All-State championship where he broke the meet record with a throw of 66-4 1/4. The New England meet record in the shot put of 62-2 3/4 is in danger of being smashed. Westbrook junior Mahamed Sharif will move up in distance to the 1000 meters where he enters as the top seed after running a Class A state meet record of 1:55.45 for 800m. Sharif has run a best of 1:54.89 on the season at the Dartmouth Relays in a race he dominated. He has had to push himself all season long so with competition it will be interesting to see just how fast he can run. The state all-time in the event is 2:29.40 run by Edward Little's Ben Fletcher back in 1999 at New Englands. Sharif has done his fast times without the aid of a banked track making his performances all the more impressive this winter. Wyatt Lord of Hampden Academy enters as the eighth seed in the 1k, he ran a personal best 1:57.42 at the Class A state meet finishing as the runner-up to Sharif. 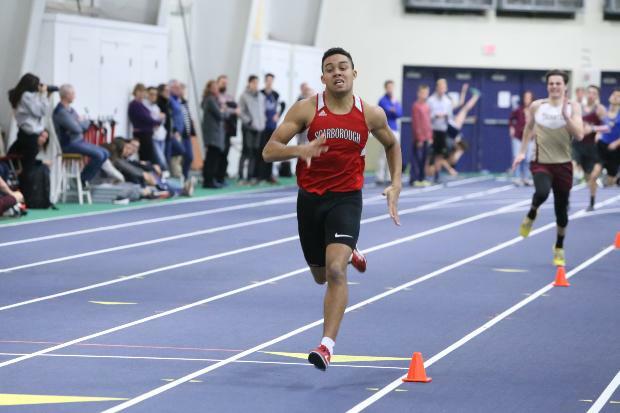 A year ago sophomore speedster Jarett Flaker earned his first individual medal at the New England Championship with his all-time state best at 300m of 34.92 which earned him a third place finish. He'll be looking to move up the podium on Saturday but will have to do so out of the second section. 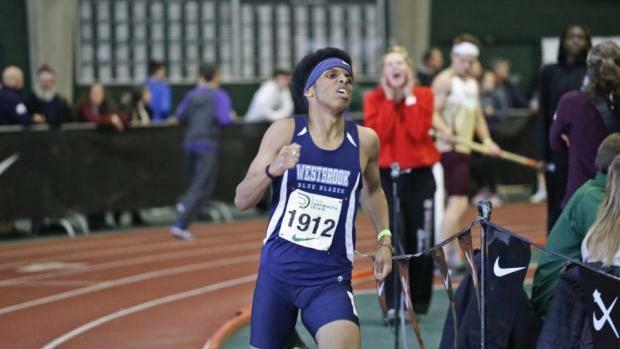 The Scarborough standout has had a great winter that has seen him run all-time state best marks at 200m (21.86) & 400m (48.73), as well as equalling the 55m (6.46). Flaker will chasing the top seed Mange Caman of Watertown, MA who is ranked 10th in the country with his 34.22 he ran to win the MA All-State meet. The high jump is an event Maine will be well represented in with Class A state champion Anthony Clavette of Scarborough, and Brunswick's Samuel Cenescar the Class A runner-up. Clavette has a best of 6-5 1/4, while Cenescar has a best of 6-6. They are with a group of four others who cleared 6-4 at their respective qualifying meets. Jack Hansen of Belfast the Class B Champion is the 10th seed in the long jump, he jumped a personal best 21-8 1/2 at the state meet.